A buckler is an ideal shield for a warrior looking for light, agile protection without compromising their offense. Conan chose to use one and now you can choose his, in the Black Conan the Barbarian Round Buckler by Marto. A buckler, little more than a small, light-weight shield, was usually of value to the warrior who was not concerned with the total protection of a shield given their size and agility. A buckler had limited use as a traditional shield and was more used as an off-handed defensive measure. 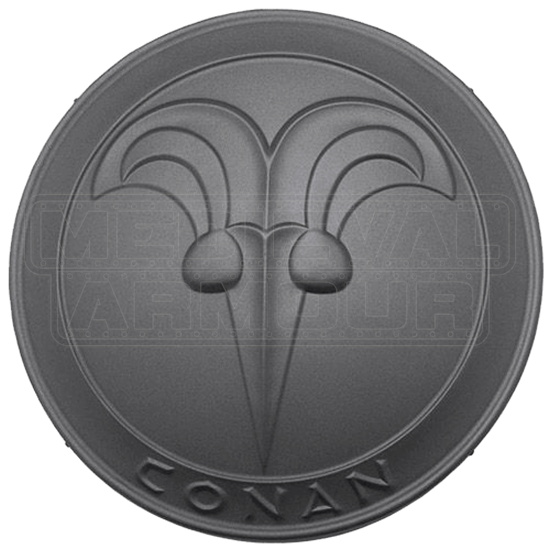 This buckler is emblazoned with the name Conan along the bottom, but is otherwise unremarkable, aside from the crest at the center of the shield. And while it is a bit large for a buckler, one must remember that the Black Conan the Barbarian Round Buckler by Marto was made for a very large barbarian.